This is one of a series of profiles of horses and riders on track for competing for 5 spots on the US Team for the World Endurance Championship, part of the 2010 Alltech FEI World Equestrian Games, to be held on September 26th, in Lexington, Kentucky. One of the qualities an international competitor on the US Endurance Team in the World Endurance Championship in Kentucky will need is focus. Sue Hedgecock knows a thing or two about focus. Focusing on being in the here and now is what kept her moving forward, away from disease and all the trauma that goes along with 8 or more years of being in and out of hospitals. She was diagnosed with nonhodgkins lymphona in 1995. She also knows a thing or two about dreams, and making them happen. "When I was sick, I dreamed of all the stuff I am doing now... watching my son grow up, fixing and landscaping our new home, and growing horses, and riding to a high level of international ability. I had not touched this before but had always had the idea of riding to an international level back in my mind - amazing what your brain will do when flat on your back or in a curled up position when bedridden!" Sue and her twin sister Sally grew up immersed in horses. As young teens in Vermont they helped a horse trader show and sell his various breeds of horses; in the summers they rode at his farm in South Dakota. "We rode all over creation - it was heavenly!" Sue and her twin sister Sally also skied a lot together. "Our family owned a small business that our grandfather started - a restaurant, inn, 3 or 4 gift shops and a day lodge and ski area, as well as cabins for seasonal or year round rental. "Since our parents worked at the ski shop in the winter it was just natural to stick us out on the snow just about the time we were able to stand up. I remember looking at Sally and then just lying in the snow because the equipment was too heavy to move!" They grew into the equipment and the sport: both ended up on the US Ski Team in their 20's. 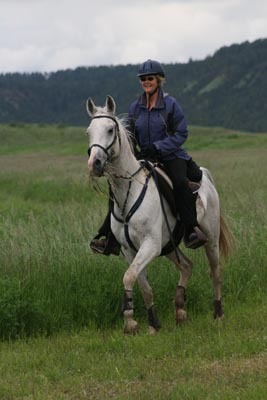 It was another thing, along with the horses, that shaped the direction of Sue's life. "Being a twin and having a great companion that could do things very well is sure an asset to striving for higher levels, whether it be skiing or horsemanship." Sue was later a coach for the junior US ski team, and she still gives skiing lessons in Deer Valley in the winters. 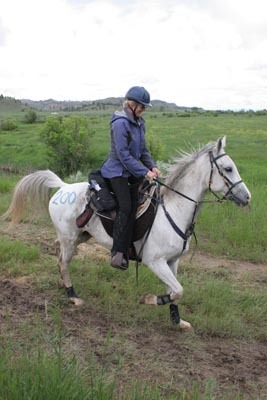 Sue's first endurance ride was in 1991; cancer interfered until her next one in 1999. Then she spent a lot of deserved time in the saddle. Endurance became passion, a continued form of healthy living. "It's looking down the trail," Sue says, that is the thrill of endurance. "It's a tremendous lure. It's an unending trail... As any endurance rider knows, going down the trail is additive and wonderful. It's so 'in the moment' - think of all the endorphins released!!" After racking up over 5000 miles by 2005, including 1 historic Outlaw Trail and 2 Tevis Cup finishes, along came LZP Julioslastchance. Julio is a 9-year-old Polish-bred (on the dam's side) Arabian off the racetrack... although it wasn't as if Sue scrutinized her prospects closely at the time. "I called up this trainer and asked him if he had any racehorses he no longer wanted and thought might make good endurance horses. My only requirement was that he had to be gray - because I was into grays at that time." Sue bought him sight unseen as a 4-year-old. "How dumb are we to buy these sight unseen horses, much less have them sent to us off the track without really knowing much about them!" Julio turned out to be a challenge. "He was full of himself!" He also turned out to be a nice horse. He still is full of himself at times - but he's smart, and he just keeps getting better and better. 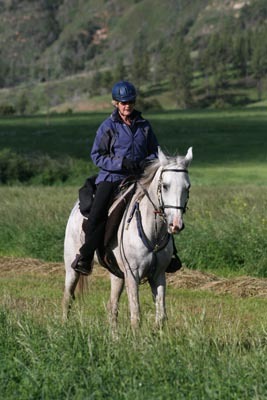 Sue has brought him along slowly and carefully, having learned a lot from her previous horses. "Julio always wants to go out and give it his best shot. He's got good ingredients." Julio and Sue had just gotten their COC (Certificate of Capability; 100 miles in 12 hours 20 minutes) in June at Fort Howes, then 2 weeks later participated in the West Selection trials for the WEC. Sue was very pleased that Julio did everything asked of him, and she loved the whole atmosphere and flavor of the trials, being coached, riding as a team, and performing as asked. This journey and the challenge of competing for a slot on the US Team for the WEC is tremendously satisfying - truly a dream come true. 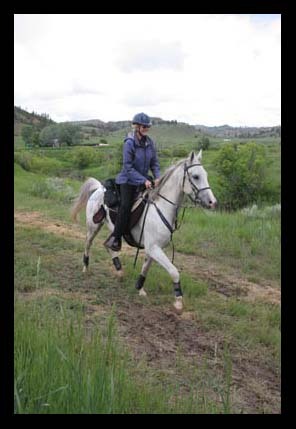 "I want to see if I have prepared my horse well enough for what I have to work with here in the mountains (living and training in Park City, Utah, where it's winter 6 months of the year). I feel if I get a good horse underneath me - build him up right - he'll carry me where I want to go. This is another test, challenge, and experience, and I hope the best horse/rider pairs get selected and do well. It has been a priviledge to have the opportunity to ride at this level on such an exceptional and kind athlete as my horse Julio. "And the greatest part of all this is to have my husband involved, and to have my son helping - having some family time throughout all this. And some very wonderful friends, like Cia and Alex Reis, carrying the load along for me too!" It's looking down the bluegrass endurance trail in Kentucky in the World Endurance Championship that is Sue's next dream. "It is just great to be alive and have the bonus of living a dream with our horses!" Oh, What to Wear Today!